Many of the oldest names in the ranges, ovens and stoves industry have roots stretching back to the days of coal and wood-fired stoves. Manufacturers released the first gas-fired stoves intended for mass market home use at the turn of the 20th century, while electric models became widespread in the 1930s. Today, choosing a stove, oven or range means deciding between a lot more than selecting either gas or electric. Modern models are available in a wide variety of configurations, with special features available between models and companies. Viking offers gas, electric, dual fuel and induction ranges in multiple configurations. Some models feature a ProFlow Convection Air Baffle for even heat distribution and a VariSimmer for gentle simmering at low heat. Samsung offers a selection of single and double ovens and ranges in slide-in and freestanding configurations. Features such as Electric Flex Duo let customers cook two dishes at different temperatures simultaneously. Available in gas and electric, LG's award-winning ranges combine the functionality of an oven with that of a cooktop. Many models come with innovative features such as ProBake Convection, EasyClean and Smart ThinQ technology. GE ranges are available in gas, electric and dual fuel models. Most free-standing single ranges feature Wi-Fi Connect technology, which enables customers to control their range remotely through a smartphone app. Whirlpool's selection of single and double ranges and wall ovens are available in a variety of capacities and finishes. Whether customers are looking for electric or gas appliances, they can find plenty of models to choose from. Founded in 1919, KitchenAid manufactures gas, electric and dual fuel stoves and ovens with innovative features such as Even-Heat Technology, EasyConvect Conversion, built-in temperature probes and self-cleaning cycles. Frigidaire manufactures 30-inch freestanding and slide-in gas ranges in a variety of colors. Features such as continuous grates, flexible rack systems and built-in temperature probes make cooking easier and safer. Maytag manufactures a comprehensive line of single and double ranges with features such as EvenAir True Convection, Auto Convect Conversion and Power Preheat technology. All ranges come with a 10-Year Limited Parts Warranty. Kenmore manufactures single, double and combination ovens with features such as AirGuard technology, which helps eliminate smoke and odors while cooking, and Warm & Hold, which keeps cooked foods warm until serving time. A subsidiary of Electrolux, Frigidaire offers freestanding, slide-in and drop-in electric ranges in a variety of colors, styles and sizes. Features such as built-in temperature probes and flexible elements make cooking easier. The heat source for ranges, ovens and stoves is the primary aspect that determines their performance characteristics. Electric: Electric heating utilizes spiral metal coils to produce heat for cooking. They provide consistent heat but are not usually the most responsive type of heat source for quickly switching between heat levels. Gas: Gas is a powerful heat source that can be quickly adjusted to varying heat levels but is sometimes not as consistent as electric heating. Induction: Induction heating utilizes magnetic waves to induce heat in the cooking vessel. It can combine the best of both worlds in that it is a consistent source of heat that responds quickly to adjustments, but it can only be used with specially designed pots and pans. The cooking surface is an important component of the appliance's visual appearance and can also impact how it should be used and cleaned. Bare burners: Bare burners place the heating element (for electric) or gas dispersal ring (for gas) on top of the cooking surface, with no covering other than a metal grill or bracket. They offer easy access for cleaning but can trap cooking debris in nooks and crannies and may be less safe due to direct access to the heat source. Glass top: Glass tops are only available with cooking appliances that use electric or induction heating. The heating element is placed below a pane of glass, allowing for ease of use and cleaning. However, care must be taken not to subject the glass to quick temperature changes to avoid cracking or bursting. Cooking appliances are available in a variety of layouts. Single combined: A single stovetop above a single cooking oven in one unit is the most common layout for cooking appliances. Dual combined: A dual combined unit contains both a stove and a cooking oven. It may include two stoves and two ovens, especially in professional-grade appliances. 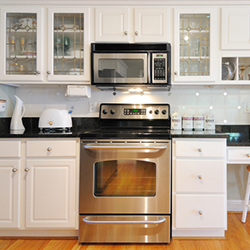 Consumer-grade appliances typically include two ovens with a single stove top. Single: Single ovens and single stoves offer convenient flexibility for users when it comes to choosing how to install appliances in their kitchen. Many cooking appliances use secondary heating sources or techniques to meet additional cooking needs and performance characteristics. Convection heating: Convection heating uses a fan or series of fans to blow the heated air around inside an oven. This ensures even distribution of the heat and can speed up cooking times. Infrared: Infrared heating is a common special feature for modern cooking appliances. It is typically used as an additional heat source for oven broiling and crisping or to turn the oven into a warming drawer. Quick heating and cooling: Some appliances provide additional settings for stovetop and oven heating that allow the heat level to be quickly raised or lowered or to maintain a specific temperature with high accuracy. Typical uses include a "quick boil" feature that allow a burner to temporarily operate at a hotter than normal temperature to bring a liquid to boil and an "accurate simmer" feature that allows the user to set very accurate low temperatures to protect sensitive recipes. A cooking appliance may contain special features for easy cleaning. Self-cleaning: Oven self-cleaning features heat the oven to carbonize stains and food debris, after which the residue can be easily wiped up. In other respects, "self-cleaning" usually refers to special coatings or enamel that discourage food debris from adhering to the surface so it can be easily wiped away. Construction: The physical layout and construction of a cooking appliance can impact its cleaning characteristics. "Easy clean" appliances often rely on glass tops and minimal use of joints to reduce nooks and crannies that might trap food debris. 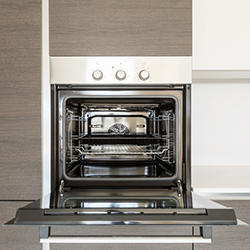 Surface coatings: Cooking appliances may include ceramic coatings related to the latest generation of non-stick cookware that make cleaning easier. Stainless steel and other surfaces can also undergo chemical applications to prevent adhesion of stains, most commonly in professional-grade appliances. Cooking appliances may contain a variety of special features to enhance the cooking experience or increase ease of use. Temperature probes: Some cooking appliances contain built-in temperature probes, allowing users to check the progress of meat or other recipes without having to buy a separate thermometer. The most advanced units can utilize the data from the temperature probe to automatically adjust heat levels. Network integration: Smart cooking appliances, including smart stoves, smart ovens and smart ranges, can be integrated into a user's Wi-Fi network to offer features like adjusting temperature from a smartphone or setting a cooking timer from a desktop computer. Software features: As cooking appliances continue to adopt the tenets of a "smart home," a variety of software features might be included. Such features can range from setting automatic "appointments" to clean the oven to setting automatic updates about the current cooking temperature. It might even include a database of recipes and other information that can be accessed using a touchscreen. Viking was founded in 1987 when it became the first major manufacturer to offer professional-grade appliances for home users. Its first appliances went into production in 1990 at its (then) newly opened headquarters in Greenwood, Missisippi, where the company remains to this day. Kenmore is one of the oldest names in the cooking appliances industry, with a history stretching back more than 100 years. Its re-introduced range of cooking appliances dominated the home market during the economic boom after World War II. Samsung has provided high-quality electronics, computer components and appliances for more than 70 years. Samsung engineers perfected microwave technology for the first home-use models in the early 1970s and their technology maintains that innovative spirit while designing modern cooking appliances. LG's history stretches back to 1947 when "Lucky" (Luk-Hai) was founded in Korea to produce plastics and other consumer goods. Since then it has become one of the biggest brand names in consumer electronics and appliances across the world. GE has been in business for more than 100 years and is one of the most recognized names in American manufacturing. It introduced one of the first mass-market electric stovetops in 1928: the Calrod Electric Range. Frigidaire's history stretches back to its founding in Indiana in 1916, when many of its most innovative "iceboxes" still used actual ice. It introduced the world's first 30-inch electric range in 1952. Whirlpool is one of the oldest names for home appliances in the U.S., with a company history stretching back to 1911. It currently sells more than $15 billion of home appliances and other products in more than 170 countries around the world. Wolf Sub Zero was founded in 1945 as the Sub Zero Freezer Company. The company began producing cooking appliances in 2000, after acquiring the Wolf Range Corporation and its manufacturing facilities. Maytag is the oldest home appliance manufacturer still operating in the U.S. and was founded in 1893. It produced its earliest cooking appliances in the early 1980s, marking its first serious foray into home products unrelated to cleaning. Wolf offers a wide range of cooking appliances, including built-in ovens, ranges, cooktops, range tops and microwaves. All products are made in the company's factory in Madison, Wisconsin, and come with 24/7 technical assistance. Founded in 1886 and headquartered in Illinois, Sears is known for its comprehensive line of ovens and ranges. Whether customers are looking for gas or electric appliances, they can find plenty of options to choose from. GE wall ovens are available in single, double, microwave combination and Advantium models. Many appliances feature Wi-Fi Connect technology, which enables customers to control their oven remotely through a smartphone app. KitchenAid manufactures single, double and combination wall ovens with features like built-in temperature probes and self-cleaning cycles. Many models are equipped with Even-Heat Technology, which ensures uniform cooking. Thermador was founded in 1916 and manufacturers home appliances, including ranges and ovens. Their Professional series brings the look and feel of a professional kitchen into the home. Jenn-Air offers slide-in ranges with features like LCD control panels, automatic reignition and auto convection conversion. Customers can choose from several fuel types, including dual fuel, electric, electric induction and gas. 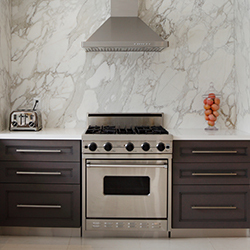 Jenn-Air brings a new level of performance with wall ovens that feature interactive LCD control panels. Customers can choose from a variety of single, double and microwave combination wall ovens to fit their needs and budget. Known for creating the world's first downdraft cooktop, Jenn-Air manufactures electric, gas and induction cooktops designed to offer power and precision. 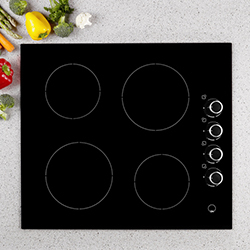 Its high-end cooktops are available in a range of stylish finishes. Founded in 1919, KitchenAid has made its name in the kitchen appliance industry with its comprehensive range of cooktops. Its gas and electric models are manufactured to high standards to deliver consistent, reliable results. La Cornue is a French luxury range and oven manufacturer that hand makes their products. Consumers should expect to wait at least two months for their ranges and ovens to be custom made with artisan craftsmanship and materials. In 1999, luxury oven manufacturer Gaggenau brought professional grade Combi-steam ovens into homes. They continue to innovate, working with top chefs to create the functionality of a professional kitchen in a domestic space. In business since 1910, Hotpoint (owned jointly by Whirlpool and Haier) ranges are available in gas and electric models. 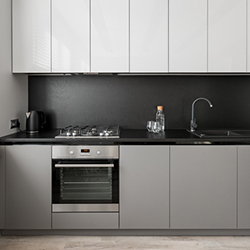 Hotpoint offers bisque, white and black finishes on their models, which range from 20 to 30 inches in size. Founded in 2013 and headquartered in City of Industry, California, Duro Corporation is recognized as a top cooking appliance brand. It manufactures professional-style stainless steel gas ranges in a variety of shapes and sizes.